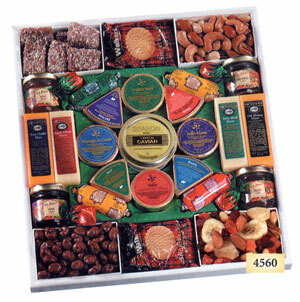 Big collection of fine foods includes Wisconsin-made cheese bars, wedges, rounds and links, caviar, confections, mixed nuts, honey, jams and jellies, and strawberry hard candies. Shipping weight: 5 lbs. Measures 11” x 12 3/8” x 2”. Case pack: 6. Prices shown per piece. 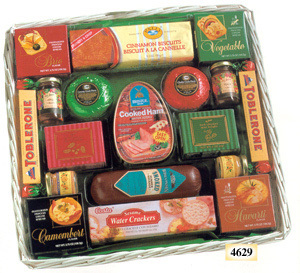 Our hand woven square tray basket contains a half pound canned ham, brie, camembert, havarti and vegetable cheese spreads, along with sausages, mustards, crackers, preserves, cookies, chocolates, Toblerone® bars, and strawberry candies. Shipping weight: 9 lbs. 18” x 18” x 3”. Case pack: 4. 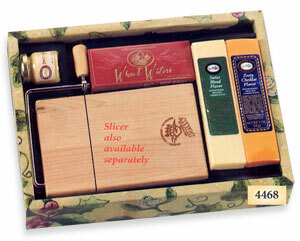 Prices shown per piece. 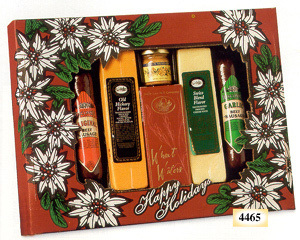 Festive poinsettia box contains Wisconsin-made cheeses, summer sausages, mustard and crackers. Shipping weight: 3 lbs. 13 5/8” x 10” x 2 1/8”. Case pack: 12. Prices shown per piece.